Kemetic Dualities: Opposition, Exegesis, and Sharp Objects. This month’s Kemetic ritual is one of exegesis, or cleansing – and it took a little while to transition it into a community ritual! In my personal practice, as most of you know, I honor both the Hellenic and Kemetic pantheons. However, I do NOT have a Hellenistic practice. If you are not familiar with the term, “Hellenistic” basically means the combo-Greco-Egyptian version of Kemetic religion that evolved after the Greeks took over Egypt politically, between the reign of Alexander the Great and the conquest of Egypt by the Romans. Nothing technically wrong with that practice, but it wasn’t mine. Reason I tell you this is because in my own practice, I had to find ways to balance the Hellenic and the Kemetic, because I generally did not work with both at the same time. And one of the ways I found to do this was to basically split my year according to the seasonal cycle and the high holidays, specifically Samhain and Beltane. Between Samhain and Beltane, the Egyptians have the primary place in my personal practice. I go to them during the winter for personal work, planning and preparation, and study. Between Beltane and Samhain, the spring and summer months, the Greeks have the primary place for me. My energy is directed more outward, I spend more time focusing on the community, I write plays, etc. This is all part of my own flow of the year; it doesn’t necessarily translate to the work I do in the Hellenic and Kemetic temples because the rest of the community does not share my cyclical commitments. However! This cycle of energies was relevant in the planning of this ritual, which is why I am giving you all this backstory. We have just passed Beltane and the primacy of place in my practice has just shifted. 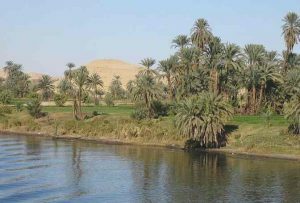 The Egyptians have not gone anywhere, but they have eased back while the Greeks have started ramping up. As most pagans will tell you, this amping up of energy is analogous to the change of the seasons at Beltane and the approach of summer. And so, before we charge ahead into creating and building and doing, we are going to pause and take a look at our starting point. For that, we turn to one of the two Netjer that I am formally initiated to – Set, the God of Storms, Chaos, and Necessary Destruction. Set is one of the more misunderstood Netjeru of the Kemetic Pantheon, mainly because aspects of his appearance and certain of his attributes were appropriated by the Judeo-Christian devil. 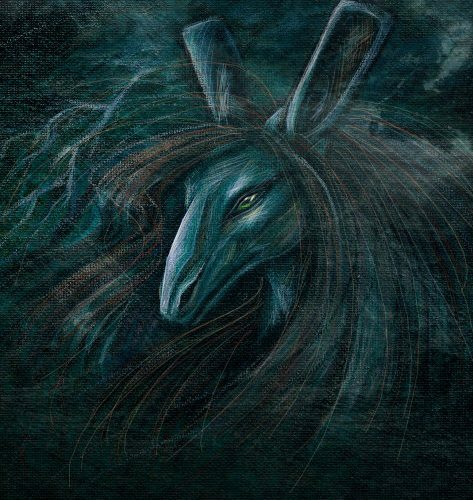 And to be fair, Set’s role in the myth of Ausar and Auset, one of the best known of the Kemetic myths, is that of the antagonist. 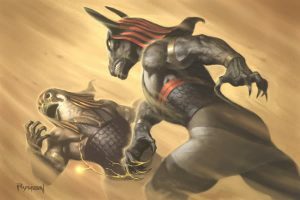 He kills his brother Ausar, the king who ruled over the Golden Age, and repeatedly attempts to kill and/or maim his nephew Heru. 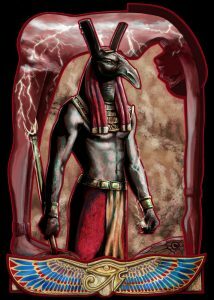 Like many gods of chaos and destruction, though, Set’s real role in Kemetic cosmology is to break down structures (and people) that are broken or weak and challenge structures (and people) to prove their strength. Because what else does Set do in the mythos? He rides with the Barge of Ra – the Sun – as it exits the underworld every night, and battles the Apep serpent who, every night, tries to destroy it and prevent the Sun from rising. While he is supported by other gods and goddesses in this, Set is the ONLY Netjer with the strength to actually defeat Apep. For the Egyptians, the sun rising in the morning was not a given. It all depended on Set’s ability to fight and defeat Apep. Thus the renewal of life and the dawning of the new day was something to be celebrated every single time it happened. In this ritual, though, we are approaching Set not as the slayer of Apep, but in his aspect as the ‘patron’ of the adversary. 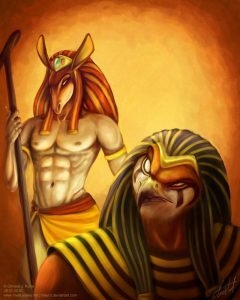 And to do this, we must also approach his twin and counterpart, Heru-Ur, or Heru the Elder. A few weeks ago, we held a ritual honoring Heru-Ur, as well as his children, the temple guardians. 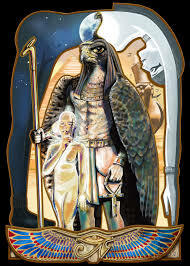 To briefly summarize for those who were not present, Heru-Ur was the fifth child of Nut and Geb who was, according to some versions of the mythos, never actually born because Set, his twin, cut himself out of the womb early. Heru-Ur remained a potential energy inside of Nut, and by extension her daughter Auset, that was eventually realized in Heru the Younger. But that’s another story. Tonight we are focusing on how Heru-Ur and Set interact as adversaries and opposites – and how they ultimately are not. The thing about adversaries and adversity is that they are necessary in our lives. They are necessary for growth and change. That is the energy that Set represents. Everyone has encountered things, circumstances, situations, and people that have made them angry, gotten in their way, and caused them problems. It can be an ongoing circumstance like a job or bad living situation, a person in your life like a co-worker or family member, or even something as temporary as a traffic jam on your way to work that caused you an inordinate amount of road rage. When we encounter these things and people and circumstances in life, we go to Set. As the antagonist, Set represents these things, but as an ally, he also has the power to make them be gone. Before he can do that, however, we have to recognize the purpose that these people and circumstances served. More often than not, the things that have caused us the most grief have also taught us, made us stronger, and even kept us safe. This is where the light and the clarity of Heru-Ur come in. He can help us figure out how – and why – these antagonistic forces have benefited our lives. This ritual is designed to help us to identify and, more importantly, understand the antagonistic forces. Then with that knowledge, we can make a choice – is this thing, circumstance, or person something that we want expunged from our lives forever, or do we just need to hit the reset button on the relationship by letting go of the anger, appreciating the lesson, and starting over? In doing this, we make a stronger foundation for ourselves, personally, as we springboard into the active summer months. Set will help us defeat the forces of opposition as we exit the winter months into a new season of activity and growth. Depending on your magical action of choice, we will either be stabbing things or setting them on fire. Because that is how Set rolls. Posted in Emergence of Auset: Kemetic Temple•Leave a Comment on Kemetic Dualities: Opposition, Exegesis, and Sharp Objects.